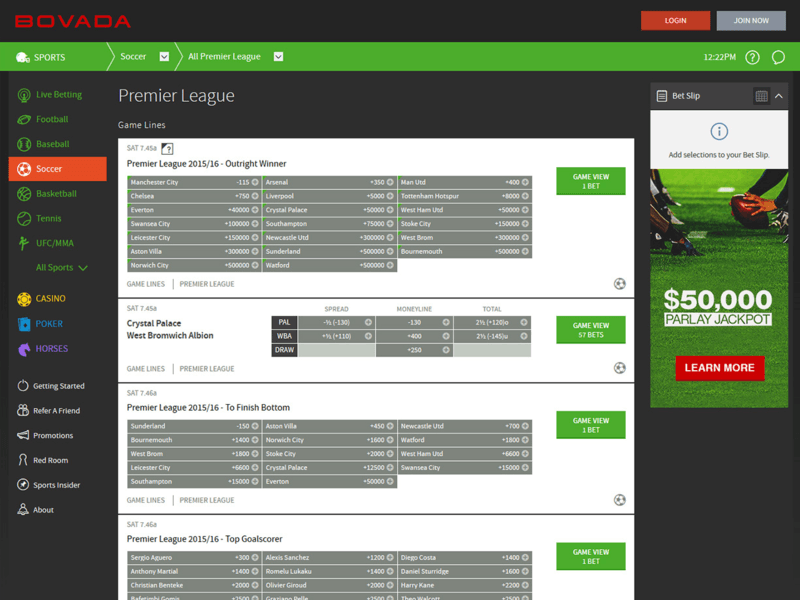 One site for all your betting needs, Bovada offers it all in one easy-to-use website. Whether you want to place some bets on your favorite sports, try your luck in the casino, or place a wager on a horse race, it is available to you at Bovada. A 100 percent welcome bonus! - Receive your 100 percent Free Bet Bonus up to $250 when you deposit a minimum of $20. Your bonus should be credited to your account within 30 minutes. 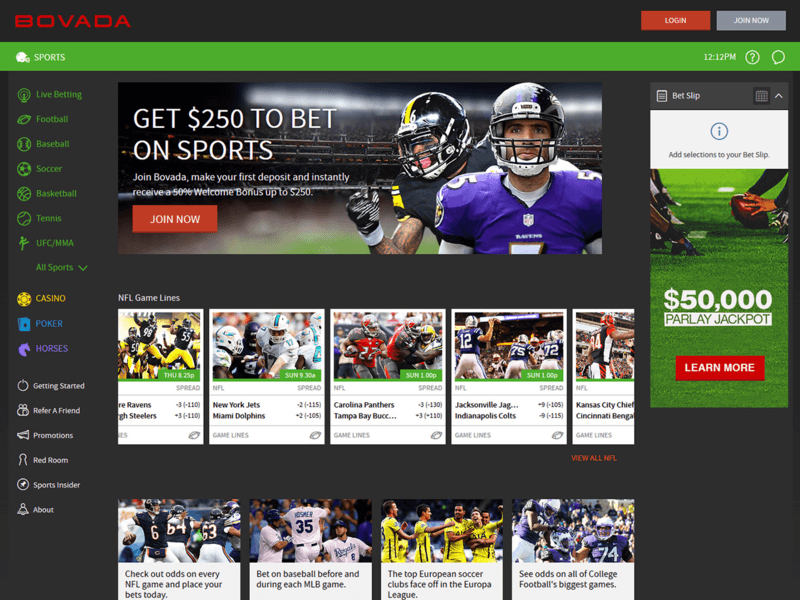 One of the most traditional and legitimately upstanding sportsbooks out there, Bovada does offer wagering to U.S. bettors on its site, but there are restrictions in place. Bovada declines bets from players in New York, Nevada, Maryland, Delaware, and New Jersey. Also, American bettors must have reached the age of majority in their home state in order to open an account with Bovada, either 18 or 21 years old. All major credit cards are accepted at Bovada. Depositing money into your Bovada account couldn't be simpler. You can deposit using Visa or Mastercard and Visa gift cards, as well as Rapid Transfer (Money Gram), Bitcoin, Bank Wire and Western Union. You can rest assured that withdrawing your winnings is just as easy and quick to do, with most of the deposit methods also available for withdrawals. Among the withdrawal methods accepted by Bovada are Rapid Transfer, Skrill, Neteller and Bitcoin, as well as check by courier. You will be allotted one free withdrawal per month. If you enjoy being in the middle of the action, look no further. Bovada offers up-to-date live betting. From the moment the game starts, bet on every play, next score, or imminent turnover as the game progresses in front of your eyes, adding an extra level of excitement to your sports betting. Whether it's who will get the next hit, catch the next pass or score the next goal, you can bet on it at Bovada. Bovada's website is extremely smooth to navigate and any information that you need can easily be located, but should you need further assistance and need to contact someone, you'll be in great hands with Bovada's excellent customer support. Reachable by email, or toll free telephone, Bovada customer service will answer any question that you might have. If you have a question, you can guarantee that you'll have your answer within minutes from Bovada's friendly, cooperative customer service staff. Everyone loves free things, especially when that free stuff is money, so you should be delighted to learn that Bovada gives all of its new customers a 100 percent free bet bonus when they create a new account and make their first deposit. The maximum bonus size is $250, which should be plenty to begin your sports betting endeavors. You may use your welcome bonus in either the sportsbook or the racebook, with a 5x rollover. It's also eligible for Bovada's casino, but to utilize it there requires a 30x rollover on both your deposit and bonus. You do not become a market leader in sports betting without having a state of the art website, which is exactly what you find at Bovada. 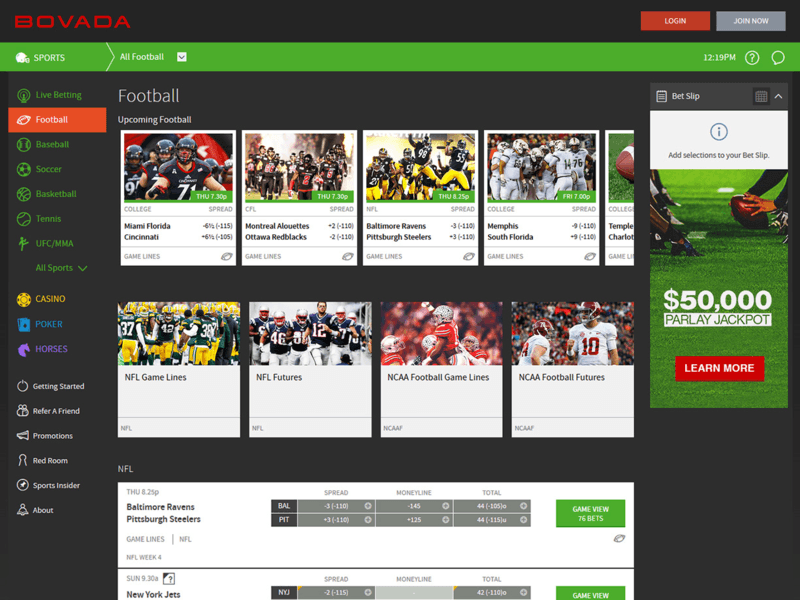 Bovada’s years of experience shines through with a simple, easy-to-navigate website that allows you to edit your options, place bets, and find the many different betting markets within a few mouse clicks. One thing that Bovada has figured out that many websites seem unable to grasp is that the way to go is to keep things clean and simple to understand and follow. 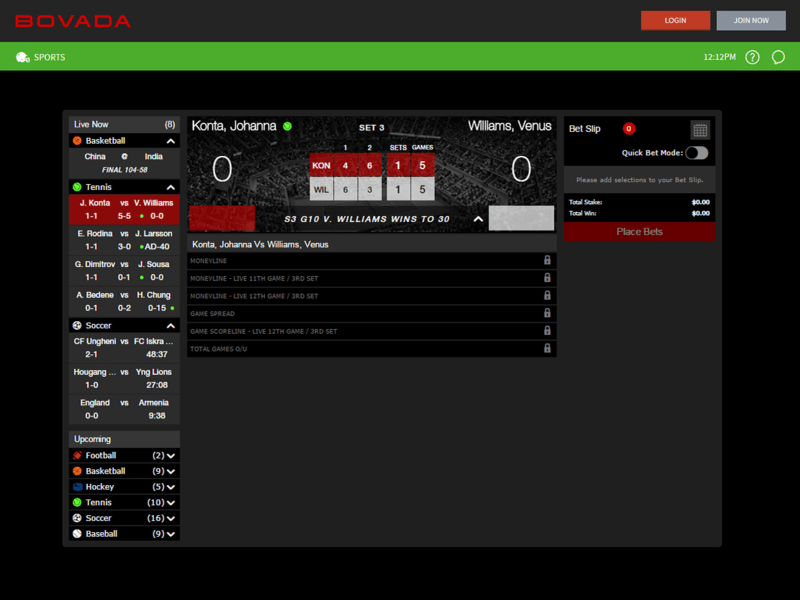 Its sleek black and grey background design is also pleasing on the eye and not garish like you find with some of Bovada’s rivals. Although Bovada prides itself on its extensive North American sports coverage, you will find several dozen more betting markets from sports around the globe. From football to hockey, from basketball to soccer, and boxing to motorsport, you are bound to find a betting market (and one with some of the industry’s best odds) for your sport of choice. You can even wager on politics at the Bovada site. They also offer a vast array of future and prop wagering. One drawback with the Bovada site is that because such a significant amount of their wagering comes from recreational bettors who tend to wait until the last minute to wager, Bovada's odds are offered among the latest posted in the online sportsbook community. If it is promotions that you want, then Bovada is the site for you. For newcomers, along with the $250 welcome bonus, there's also a $3000 casino and $5000 bitcoin welcome bonus. Bovada's refer a friend bonus offers a 200 percent match of your friend's initial sign up amount when you get someone to join Bovada. Bovada also offers an up to five per cent rebate on all horse bets - three percent on straight bets and five percent on exotic wagers. In Bovada's casino, there are reload bonuses, a bonus for trying out their mobile casino, and weekly promotions for playing blackjack, slots and table games. Bovada's Red Room is their exclusive VIP rewards program. Members receive weekly deposit bonus offers, personalized service, cash rewards, expedited payouts, and more. Bovada's sportsbook, racebook and casino are all accessible on your mobile device. You can wager on your favorite sports, on the races from all the top tracks, or play dozens of different casinos games on your smartphone or tablet. Bovada's parent company has been offering its services to customers around the globe for almost 20 years. Lasting this long in the online gambling industry, and doing so with a glowing reputation, goes some way to show how superb Bovada is for sports bettors and casino game players. They've accepted nearly 300 million wagers since 2011. As well, if you are new to online gaming, Bovada is a greatB starting point because they cater to the recreational player. The sign-up bonus at Bovada is generous, the customer service team (which you will probably never need) is one of the best in the business, and the odds on offer are up there with the market leaders, making Bovada the online sports betting site of choice for tens of thousands of people. Are you one of them? Bovada's casino offerings have witnessed more than four billion spins at their slot machines since they first went online in 2011. Nearly two million rounds of blackjack have been played at their virtual tables, making it far and away the most popular game on the site. Listening to their customers, Bovada rapidly expanded its slots parlor and now offers double the variety of games from the time they first opened for business. If you like to play the ponies, this is also the place for you. Bovada offers wagering from 94 tracks and has paid out on over 130,000 Superfecta wagers since December of 2011. Bovada does not offer its own poker room. Get this bonus with your first deposit! Close Visit Bovada and see for yourself... Bet now!